Among the issues raised by consolidation within the banking industry is a concern that small businesses will be less able to obtain credit as community banks are acquired by larger or non-local institutions. Community banks have traditionally been a major source of funding for small businesses. The impact of bank consolidation on credit availability may depend in part on whether the remaining community institutions expand their small business lending activities. 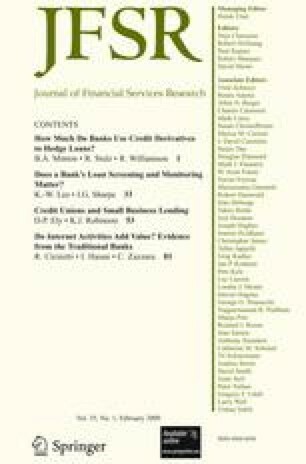 This study examines whether credit unions have a propensity to extend business loans in markets that have experienced bank merger and acquisition activity. We find some evidence that credit unions are more likely to engage in business lending in markets characterized by greater bank merger and acquisition activity. Moreover, the estimated economic significance is meaningful in many of the specifications. The authors would like to thank Drew Dhal, Mark Vaughn, participants at the 2005 Western Economic Association meetings and the 2004 meetings of the Financial Management Association for helpful comments and suggestions. Any errors are our own. The views expressed are those of the authors’ and should not necessarily be attributed to the Federal Reserve Bank of Dallas or the Federal Reserve System.